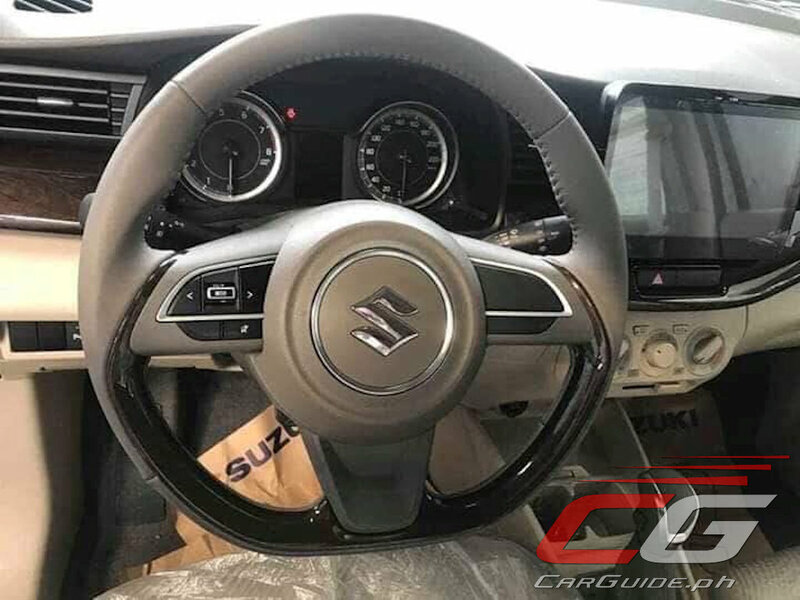 UPDATED: Are These the 2019 Suzuki Ertiga's Specs and Prices? 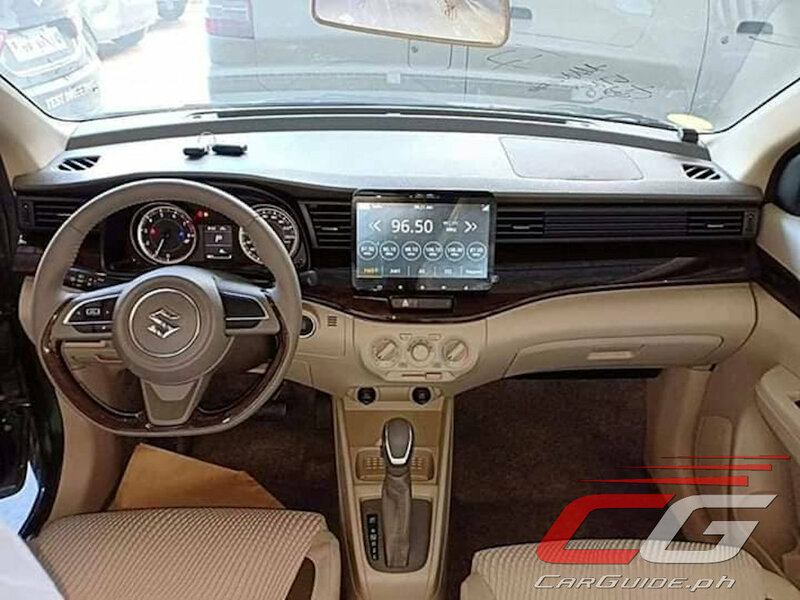 UPDATE: Suzuki just launched the all-new Ertiga, check out more photos and full specs here (1/24). 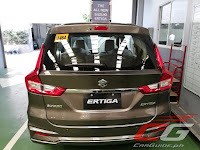 The all-new 2019 Suzuki Ertiga is formally launching this Wednesday, January 23 so it comes as no surprise that several agents from various Suzuki dealers have begun pre-selling it. And as we know, whenever there’s pre-selling, there are leaks. 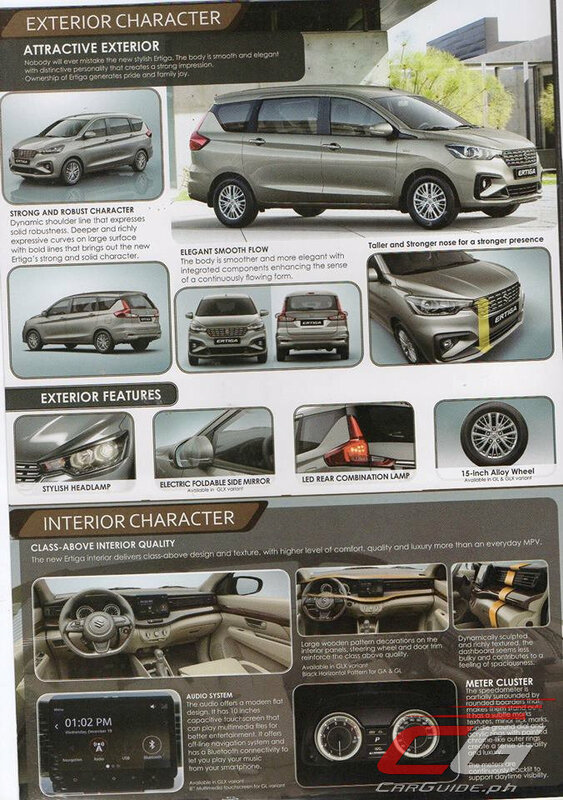 The most complete we’ve seen so far is this leak of the 2019 Ertiga’s brochure. You can check out the blurry cam pics for yourself below, or you can scroll down and see how we’ve deciphered the specs Suzuki’s best-selling MPV. 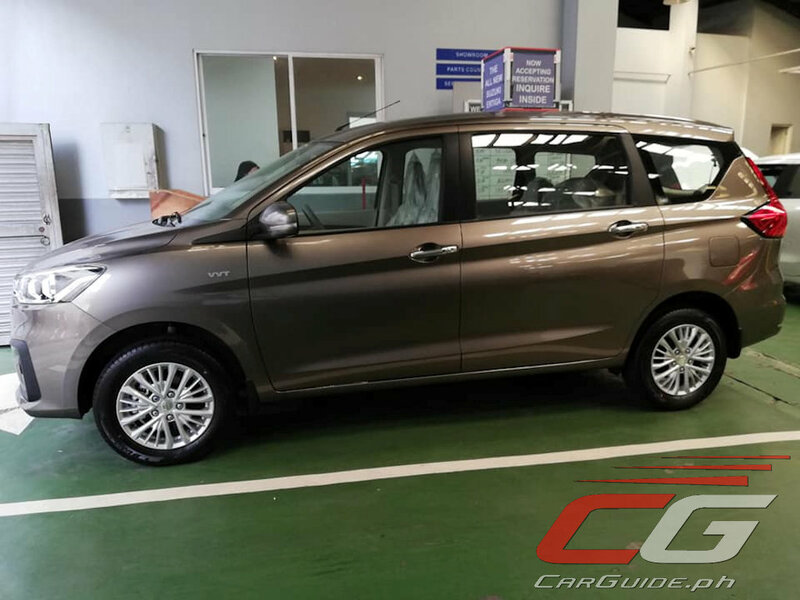 The 2019 Ertiga gets a taller nose for a strong presence. This is complimented by a deeply cut shoulder line that runs through entire side, and LED rear combination lights which are now standard across the line-up. Projector-style headlights look to be standard too while only the top-trim GLX gets electronic folding side mirrors. 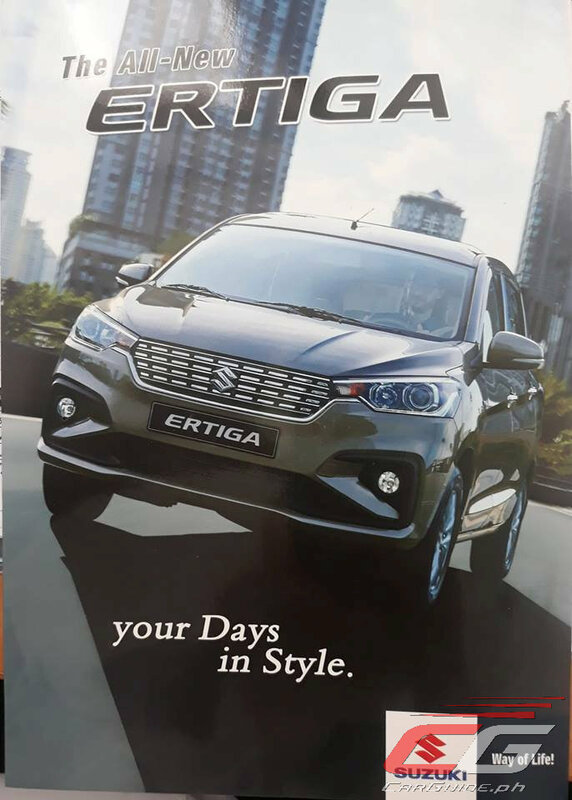 Compared to say, the Mitsubishi Xpander which went for a sportier full-black interior, the 2019 Ertiga continues with its homey beige color scheme. 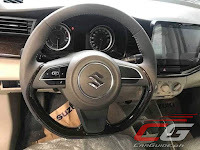 The same flat-bottomed steering wheel makes an appearance as do the vertically-resting dials. 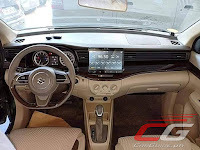 One of Suzuki’s interior highlights has always been its infotainment system and in the case of the 2019 Ertiga, the range-topping GLX comes with a 10-inch capacitive touchscreen system (8-inch for the GL) that integrates multimedia playback, Bluetooth connectivity, and GPS navigation. 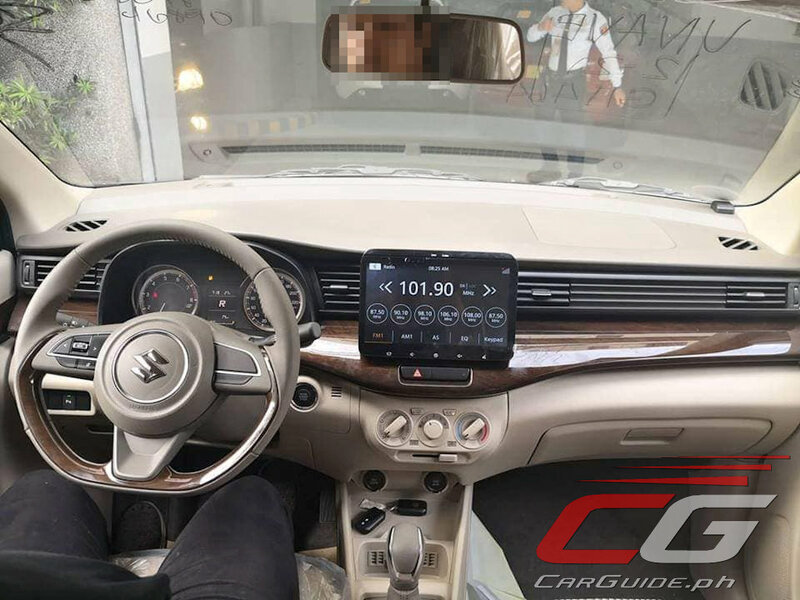 The GLX also gets the added convenience of audio controls. 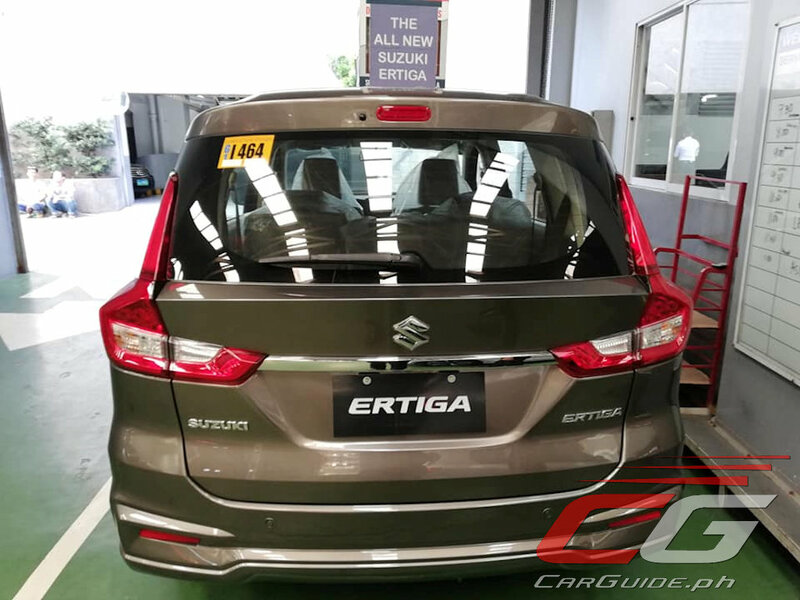 Suzuki is quick to highlight that the 2019 Ertiga is larger in all dimensions. It offers 70 mm more hip distance between the second and third rows; 10 mm more distance between the driver’s side hip and upper trim (20 mm on the passenger’s side); and 5 mm more headroom on the third row. 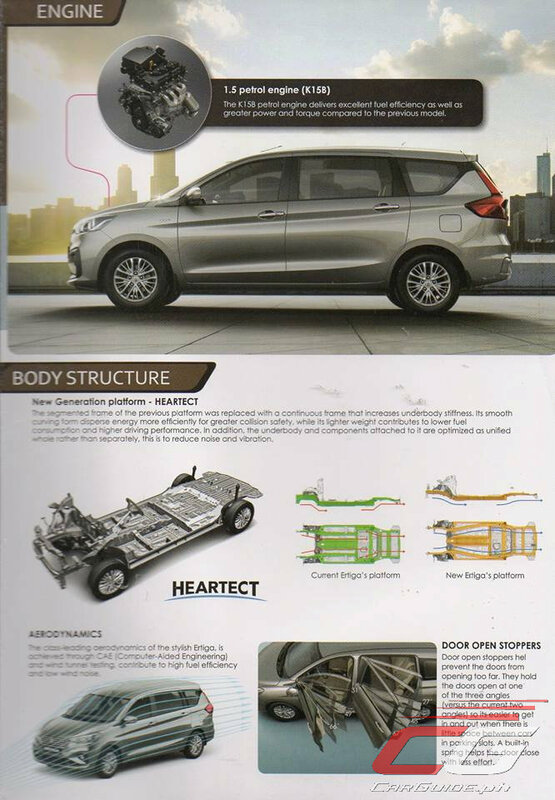 Aside from added space, the Ertiga also boasts of improved cargo flexibility. The third row (50/50) and second row (60/40) seats both fold forward boosting cargo space. The second row features a new “walk-in” mechanism which slides the seats there forward improving access to the third row. In addition, the seats themselves slide fore and aft increasing the available knee room for those in the backmost row. Improved “door stopper” mechanisms allow doors to swing at three pre-determined stops (versus two in the previous Ertiga) making it easier to get in and out of tight parking spaces. A built-in spring helps the door close with less effort too. The GLX variant comes with ventilated cupholders near the center console to keep drinks like soda cool at all times. Power comes from a Euro 4 compliant K15B 1.5-liter gasoline engine. Fitted with variable valve timing, it makes 105 horsepower at 6,000 rpm and 138 Nm of torque at 4,400 rpm—an increase of 10 horsepower and 8 Nm from the previous 1.4-liter motor. Available transmissions are a 5-speed manual or a 4-speed automatic (depending on the variant). 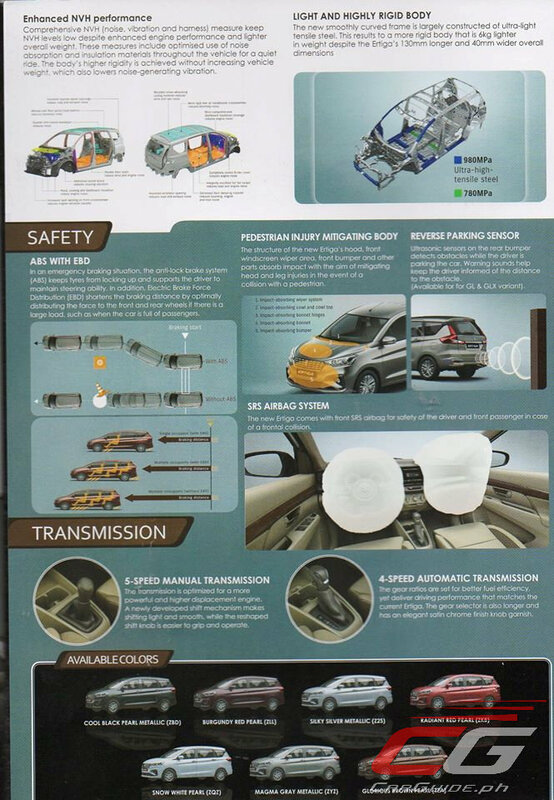 The 2019 Ertiga is loaded with the right safety features. Standard across the line-up are dual SRS airbags and ABS with EBD while reverse parking sensors make their way on both the mid-tier and top-tier GL and GLX variants. The 2019 Ertiga comes in 7 colors: Cool Black Pearl, Burgundy Red Pearl, Silky Silver Metallic, Radiant Red Pearl, Snow White Pearl, Magma Gray Metallic, and Glorious Brown Pearl. There’s a total of 4 variants: the GA M/T (P 728,000), GL M/T (P 848,000), GL A/T (P 888,000), and GLX A/T (P 978,000). This is shaping up to be another big winner for Suzuki. Nice pricing. 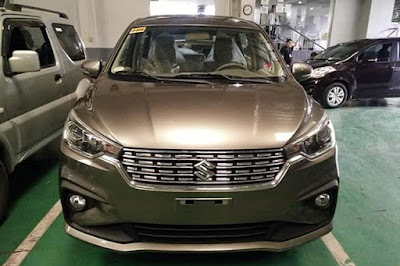 Good job Suzuki PH. A 7-seater wagon with a 1.5l engine under a 1M, this is a good buy. They could have taken a page off the Xpander's playbook and not make the PH model have biege insides. 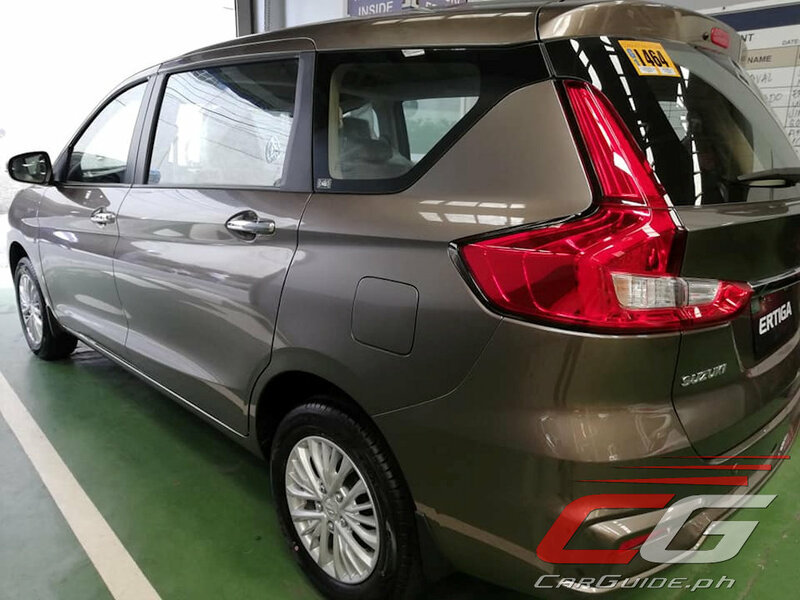 The pricing is better compared to the Toyota Rush and Honda BRV/Mobilio.